It’s that time of the year – that of the Year In Review! Join us in retracing the main steps of our journey… to try and guess what will happen in the new year that has just started. 2017 was a year full of challenges for us here at MailUp. We launched an industrial group, we presented a brand-new platform with tons of innovative features, and we held our first major event open to the public. And that’s not all! Our ultimate goal is to offer those who deal with digital marketing the most effective, intuitive and high-performing solution for their multi-channel marketing campaigns. You need a reliable, efficient and high-performing product. You need competent and creative people who can listen, put forward solutions, and unearth innovative ideas to satisfy every need. You need fast and comprehensive support and assistance that can resolve doubts, issues and problems without any delays or uncertainty. You need training, shared knowledge, food for thought, for personal and professional growth. “Give a man a fish and you feed him for a day. Teach him how to fish and you feed him for a lifetime”: we are not satisfied with simply providing an excellent product; we want those who use it to improve their skills every day. You also need to feel safe: the type of safety offered by our 15 years in the field, by relying an internationally acclaimed solution, and by the presence of an established industrial group. Even better if the group is constantly growing, is listed on the stock market, and has won awards from the industry’s most authoritative institutions. Let’s dive into the details to find out how these ingredients fell into place for MailUp in 2017. In the early 2000s, a small web agency was founded in Cremona. Over the years, it developed into the MailUp that we know today: an international company and market leader in Italy with 9 locations worldwide, one of Europe’s leading players in the field of marketing technology. Today, MailUp is no longer “simply” MailUp: it is a group which, thanks to several acquisitions, has grown to include 5 business units with distinct markets and fields of activity. This is what we now call the MailUp Group, which has had its own identity since the beginning of 2017. 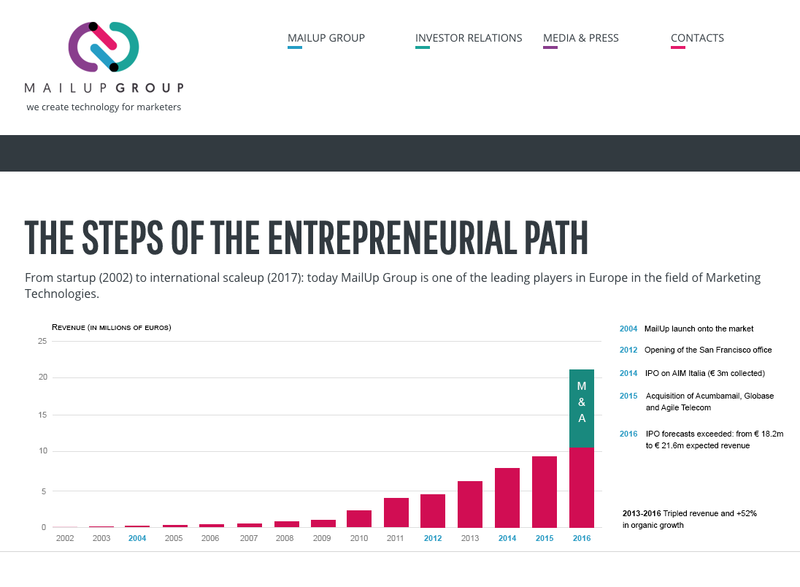 “With mailupgroup.com, we didn’t just want to create a new website – we wanted to convey what it is that made the Group a leading player in Europe in the marketing technology sector, progressing from a turnover of 6.5m euro to 18.9m euro in the space of three years. A journey of growth stretching from 2003 to today that has transformed us into a corporate group with 9 offices worldwide and a brand portfolio offering its solutions in over 50 countries”. 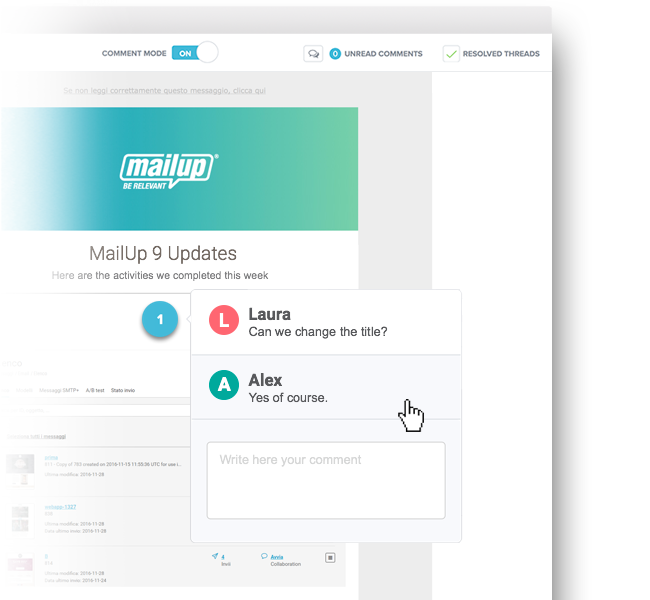 On February 1st, we had our first major product release in 4 years: MailUp 9, the most advanced and powerful MailUp marketing automation platform ever. Following a total redesign, the new solution makes it easier than ever to create, send and track email and SMS campaigns, giving you an unprecedented level of control. A great deal of emphasis is placed on marketing automation: with MailUp 9, this becomes simpler, more intuitive, and above all able to cover two fundamental channels – email and SMS – in the same flow. Introduced along with the release of MailUp 9, Collaboration is a unique tool. It is designed to streamline and facilitate feedback processes and the approval of email messages – a process that is often long and complex, since it requires the contribution of various people or teams. This applies to corporate teams, and even more so to flows between agencies and customers, which require phone calls, email exchanges, and conference calls. Thanks to Collaboration, you can share, comment on and approve every part of an email message (logo, images, copy, etc.) with just a few simple clicks. A simple yet ingenious solution. As hackneyed as this slogan may sound, there is no higher truth for us: people are at the core of everything we do, whether they are existing customers or potential ones. For this reason, we made significant investments and restructured internally in 2017 to strengthen the departments that play a key role in establishing a long-lasting, fruitful relationship with every customer. We hired 27 new employees and completely restructured our Agency, Solution Advisory and Accounts departments. December 12th, Palazzo Mezzanotte, Milan: our dream of a full-scale event open to all became a reality. 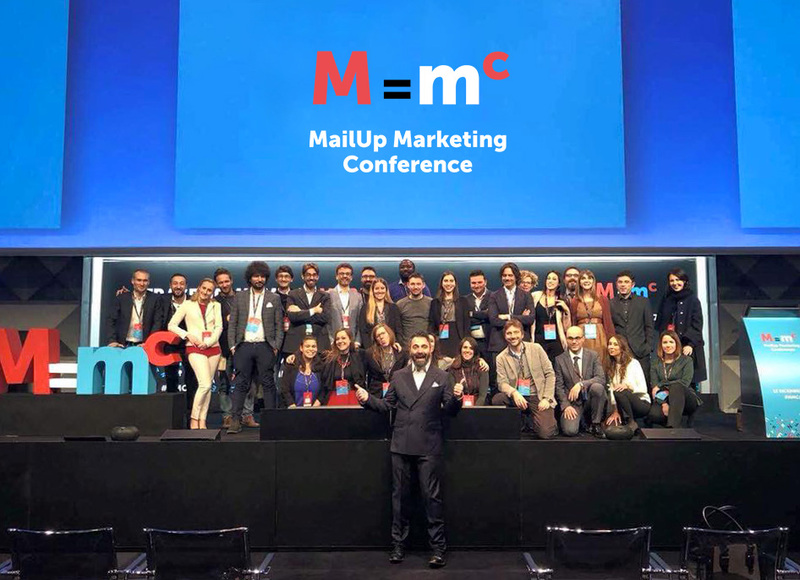 MailUp Marketing Conference was the first event organized by MailUp and open to marketing professionals from all backgrounds, allowing them to share and learn more about digital marketing topics. 400 participants, 18 speakers, 8 hours of pure energy focused on the present and future of digital marketing. It was a great success for us – until a year ago, we had never faced such a large and challenging task. We will most likely repeat the event in 2018, with the goal of offering valuable content, speakers beyond the “usual suspects”, and new impetus for the digital field. Those who follow us know it well: here at MailUp, we believe that sharing knowledge is the best way to help our customers (and not only) grow. Our investments in training and content creation grew in 2017 and will continue to do so in 2018, and these investments will see us organizing an increasing number of live events. In 2018, we won’t stop on our journey towards a training solution that is more comprehensive, interesting and in-depth than ever: we are working on some great new features, so stay tuned to find out more! 2018 will be the year of the GDPR, i.e. the new European regulation on the processing of personal data. It will be a genuine revolution that will change the way big and small companies acquire, manage, and consider data. On the one hand, we are updating the MailUp platform so that everything will be fully compliant with the new legislation on May 25th, 2018 (the date on which the GDPR definitively comes into force). On the other hand, we are helping companies to deal with the new regulatory and jurisprudential environment that they will have to face. That’s why we have written a series of blog posts that explain the mass of regulatory references in an understandable and accessible way. And our work on the GDPR certainly doesn’t stop there: the first few months of 2018 will be essential for fine-tuning all those structures and procedures that will allow companies to prepare themselves for the day when the new legislation comes into force. We will be there with a series of training activities specifically designed to facilitate this task; further updates to follow shortly. MailUp is an open solution that works best when used within a structured marketing stack. This is why we work, both alone and with third-party companies, to promote the development of integrations that allow systems to speak and interact with each other, giving rise to streamlined workflows and more effective strategies. LeadsBridge, used to automatically synchronize the contacts collected through Facebook lead ads with the MailUp platform database in real time. Vtiger, used to allow MailUp to communicate with the Vtiger CRM. PieSync, which enables the two-way synchronization of data between MailUp and a multitude of other platforms. Passendo, used to turn newsletter traffic into a new and profitable source of revenue thanks to the insertion of advertisements. 2017 couldn’t have ended with a more coveted accolade: inclusion in the Technology Fast 500 EMEA 2017 ranking by Deloitte, which is the list of companies operating in a variety of tech sectors that recorded the highest revenue growth percentage between 2013 and 2016. Thanks to our average revenue growth of 240% between 2013 and 2016, MailUp ranked 471st at the EMEA level and 6th in Italy. This was achieved thanks to tireless work in terms of both entrepreneurship and technological research. 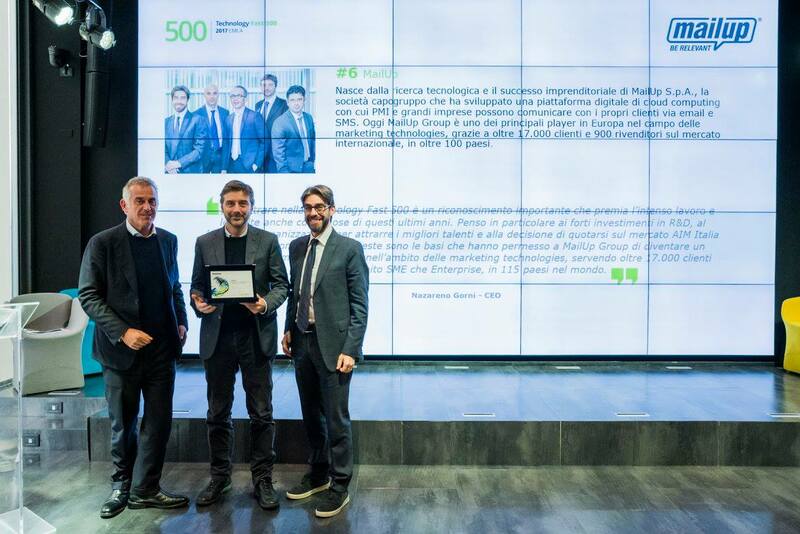 In the picture: MailUp Group CEO Nazzareno Gorni and MailUp General Manager Luca Azzali (center and right), recipients of the accolade from Deloitte. We certainly didn’t spare ourselves in 2017, and we don’t plan to in the upcoming year either. We will be releasing a lot of brand-new, highly significant technological content, with a focus on messaging content and applications… but we don’t want to give too much away just now. Special thanks go out to all those reading and all our followers. 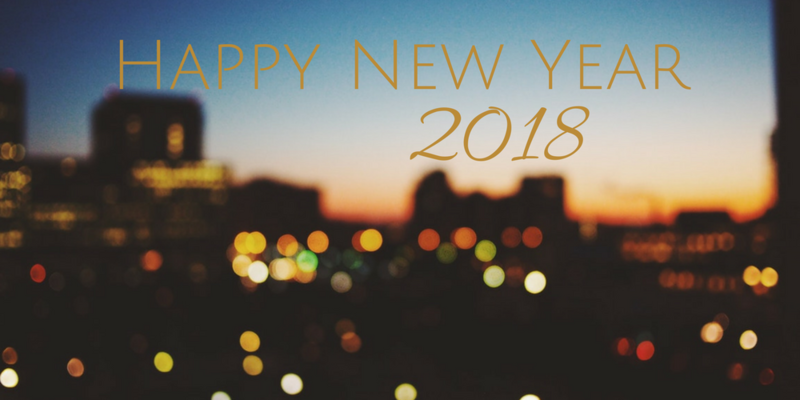 Best wishes for a great 2018 from the entire MailUp team: may the new year bring you satisfaction and success.